Over 15 years ago, my brother acquired a double-bit axe. He loved it so much that he named it the way a knight names his sword. He even wrote the name on the handle of the axe (in Sharpie pen). The name, you ask? "Testosterone". Yes, "Testosterone". With the name on the handle, my brother could say that his double-bit axe had testosterone written all over it. I always thought it was funny, but really didn't "get it". I figured it was a "guy thing". Well, after swinging a sledgehammer at concrete for the past few days, I now "get it" (light finally dawns on marble head!). I don't know if I can actually express it in written form, but I "get it". Now in the title of this post I mentioned that I have two hammers. My other trustworthy tool is this snazzy pick hammer I splurged on at Ace hardware just for this job. I am constantly amazed as how powerful it is just because of its design and the strength of my swinging arm. When Hubby emerged from his home office after being buried in meetings yesterday afternoon, he came out to see my progress. 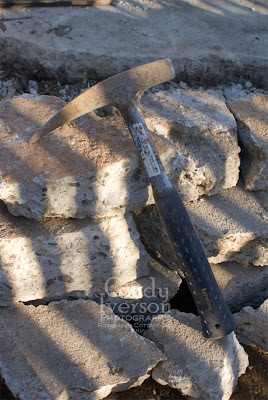 He happened upon me when I was "taking a break" (that's code for sitting down) and swinging my pick hammer at the edges of the slab to entertain myself. I told him I felt like one of the seven dwarves with this nifty little hammer. Hubby laughed and said I was the eighth dwarf. I had the song "Heigh Ho" going through my head for the rest of the time I worked out there yesterday. "So what the heck are you doing?" I can hear you asking. Well, I mentioned in yesterday's post that a 20' x 20' open-sided lanai/shed/???? was here in the back garden when we bought the house. We know it was built in 1961 because someone etched the year in the concrete before it set up. The half walls on three sides of the structure were thick slabs of concrete with massive non-indigenous rocks and abalone shells set in them. 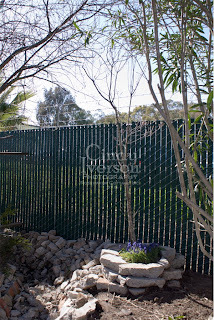 The owners before us had boarded it all up with plywood which we removed shortly after moving in replacing the front siding with white plastic lattice so air could flow through and a wild rose to grow up it while leaving the sides open and the back intact. Even with that air flow it still got about 125°F (52°C) inside there during the height of summer. The pad of the structure was not well planned and over the years had heaved and cracked with huge cracks splintering the pad. Some cracks were split open up to 3-4 inches! Then add to that our drainage problems in that area of the garden, and we had a nasty mess. After we determined that the structure was unsalvageable (it took us about 6 years to come to that conclusion), we decided that we should take it down and put a smaller pre-fab shed in its place and then use the rest of the precious real estate it was taking up for raised planting beds. 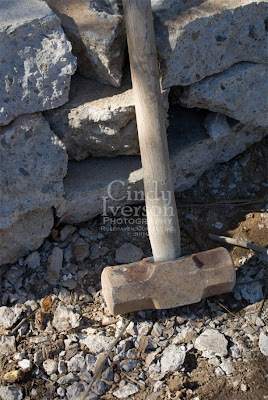 My pick hammer helped me to extract the rocks from the half walls fairly successfully as I broke up those last summer. Late last summer we removed the corrugated tin roof, recycled it, and then dismantled the lumber that was badly suffering from dry rot and termite damage making the whole thing very unsafe. The only problem was how to resolve the drainage issue. The time right before I go to sleep is the time when I churn over such problems searching my brain for a solution. It eventually came to me one night that the new shed should be built on a raised bed too! All I had to do was take the concrete from the pad and build a raised bed just like the smaller planter beds I've built around the garden and then fill the whole thing with pea gravel. That way the water will just drain right through and head down the "french drain" trench that I am also completing simultaneously with the recycled concrete chunks and chips from the demolition of the pad. Just today I completed the construction of the base of what will be the raised bed for the shed. I'm pleased as punch with how it looks! It was like putting together a giant jigsaw puzzle with very heavy pieces except there wasn't any "right" way to do. I could just improvise as I went. I know that the lizards and lots of other critters will love hiding in all the nooks and crannies of this base after we have everything done. I can't wait for them to move in! A bonus that happened during the process of doing all of this was that I figured out where to finally plant the dogwood tree I inherited and how to do it. Using some of the recycled concrete I built a planter around it after sinking it into the ground over a foot. I was even able to leave the little grape hyacinths growing at the base undisturbed. I think the dogwood will be very happy in its new home because dogwoods like moisture and this one is snugged up against the trench that will be the major "french drain" that carries water from the rest of the garden to the storm drain in the back corner. And there's more hidey-holes in the dogwood planter for lizards, frogs and other small critters! I am so glad I'm getting all of this done now when it's cooler outside because there is NO WAY I could do this in the summer! Wow. What a big job. I am impressed. Who do you think you are? Paul Bunyon? She-rah, Warrior Princess, He-Man. Good for you girlie. All of this whacking and hammering just sets those endorphines free! I used to split wood with a splitting mawl... very satisfying! I can totally picture your brother doing that! It looks great. You've done such a good job. I need you to come up here and design our landscaping! Good lord, woman! You are amazing. In earlier days I might have taken something like that on, but not now! I'd rather run 13.1 miles any day! NOT! Just kidding. I'm impressed, Cindy! Everything is looking GOOD! This sounds like a movie, with you swinging the sledge, and simultaneously planning the plantings for the area. Talk about multi-tasking. I am envious of your arm strength. I can so identify with this post! When I lived in Alabama my neighbor had his driveway redone and I asked for the concrete. Two LARGE dump-truck loads of concrete ended up in my yard! I must have been crazy! I got out there everyday with my sledge hammer and broke up that concrete for raised beds. It was really enjoyable work but I sure wouldn't want to do it again. First of all, you must be in amazing shape! And second, what a wonderful idea! IT is going to be "smashing" when it is done!! This is nothing unusual for Cindy...she just doesn't tell you about the other stuff she does. You go girl ! Years ago I would have tackled that one, but not anymore. You Amazon woman, way to go. 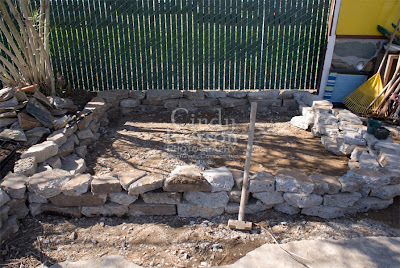 Wow, I broke up a concrete/brick barbeque and thought I was queen for a week. A whole shed slab? You really are amazing. Girl you are wonder woman! You go girl,you certainly did a good job there!I loved getting stuck into projects like this!Beth and I dismantled a huge fireplace in our old house and rebuilt a new one,she was about 12 at the time and as far as she was concerned this was the norm for us,whatever needed doing we just got on with it!What's next Cindy lol ! I must admit that I enjoy the 'heavy' work sometimes. It makes me feel so...strong. We have railroad ties to replace, install on our hillside and I'm actually looking forward to it. How crazy are we?? !